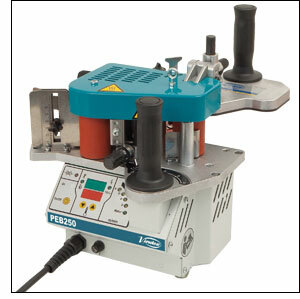 Hot melt portable edgebander. For PVC, ABS, melamine laminate or veneer tapes, previously cut to the required length, on straight, round or shaped panels. Very practical for small manufacturers due to its easy operation and fast adjustment. The tape height adjustment and panel thickness is very easy and intuitive. Equipped with assisted tape feeding and electronic speed control to work at the most convenient speed. Gluing roller with polymerization processing. Allows to band ABS tapes with 3D and glass effect. With electronic temperature control the machine is also equipped with a precise control for the glue dosage on the tape. Glue pot and tape sliding base covered by Teflon for easy cleaning and maintenance. Hot melt edgebander with stationary table. For PVC, ABS, melamine, laminate or veneer tapes, on straight, round or shaped panels. Very practical for small manufacturing series, especially on straight panels. Easy operation and fast adjustment. Table with extending frontal guide to work with total stability. The height tape adjustment and panel thickness is very easy and intuitive. Equipped with assisted tape feeding and electronic speed control to work at the most convenient speed. With electronic temperature control the machine is also equipped with a precise control for the glue dosage on the tape. Glue pot and tape sliding base are covered by Teflon® for an easy cleaning and maintenance. It's equipped with roller holder and automatic rear tape cutting. 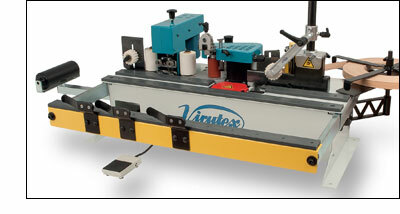 The glueing unit can be used as a portable edgebander just taking away the three screws which fix it to the table.